Hibco Construction is a cutting-edge and progressive Edmonton construction company. We offer full-service construction services for both residential and commercial projects. Our team of general contractors come with years of experience and a focused, goal-oriented passion for what they do. Other Edmonton construction companies offer similar services, but none of them come with the same level of originality and passion as HIBCO. As one of the leading construction companies in our city, HIBCO has earned a reputation for high standards, high-quality and proven results. 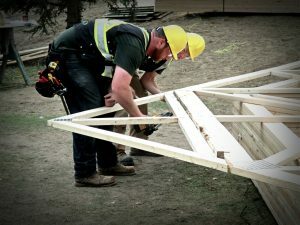 As Edmonton general contractors, we believe no job is too big or too small. Whatever your construction needs, our staff are well equipped with the knowledge, skill, and resources to deliver the outcome you are looking for. If you are ready to bring a dependable and forward-thinking Edmonton construction company on board for your project, we want to hear from you. We also encourage you to take a look at our website, check out some of the projects we have been part of in the past, and review our testimonials. We like to let our work and the people who have benefitted from it do the talking. After all, we’re busy doing the building! At HIBCO, we understand that you need a team that you can trust—a company who is here for you and is committed to ensuring your project is completed efficiently and thoroughly, every step of the way. We at HIBCO are passionate about delivering a job well crafted. We’re not just dedicated contractors, we’re also passionate members of our community! 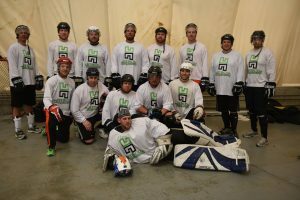 We have our own community league sports teams, volunteer with non-profit organizations, and love discovering new ways to be a part of the place we live – Edmonton. For more information about how we’re involved, check out our Instagram page or visit our blog! Whether it’s our time, services, or a financial contribution, we are always proud to give back. 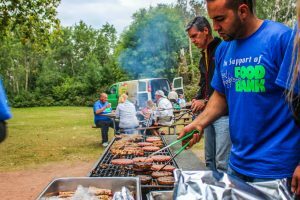 We partner with Edmonton Food Bank to eliminate hunger in Edmonton, and we also host regular office fundraisers to support local causes. Our team is passionate about making a difference, and every opportunity to do so is considered! We encourage you to reach out to us with ideas or opportunities. We uphold the highest standards for the end results of our construction projects. We know that our clients expect a superior product when their project is finished, and nothing matters more to us than making sure they get it. No other Edmonton construction company cares more about excellence than HIBCO! All our team members are highly-trained, certified, and experienced in their craft. Our licenced general contractors have extensive knowledge of both residential and commercial construction, and our specialized craftsmen know how to produce quality down to the smallest detail. We are always happy to produce our qualifications, client testimonials, and our certificates to solidify your confidence in our team! From the design phase, through to construction, and then the finishing touches, our team is the only team you’ll need. We can take on a long list of construction jobs, from millwork to framing to demolition. If you’re looking for a company that can take on any building project, HIBCO is the right choice for you. QUALITY IS NOT JUST A CATCH-PHRASE, BUT RATHER A STANDARD OF EXCELLENCE AND A COMMITMENT TO DETAILS. THE CALIBRE OF THE PLANS, LABOUR AND MATERIALS THAT COMPOSE A PROJECT ARE WHAT WILL DEFINE THE OUTCOME.